Kingston Brass Polished Brass 1-1/4-inch Decorative Bottle P Trap CC2182: This 1-1/4-inch Decorative P-Trap is built to last. The highest quality standards are used to precision manufacturer a top of the line product. Important features of this BRAND NEW Fixture: Complete Item! Everything necessary for installation is included. 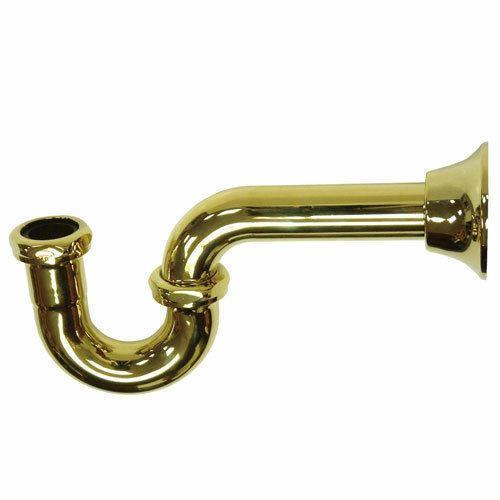 Matching Accessories Available - Easy to Install - Installation instructions included - 1-1/4-inch Decorative P-Trap - Classic -inch P-trap, double cast brass construction; adjustable outtube; slip-joint inlet, available in four finishes. - Fabricated from solid brass material for durability and reliability - Made from a premium color finish for resistance of tarnishing and corrosion - Standard 1-1/4-inch connection - Coordinate perfectly with your bathroom decor - Polished Brass premier finish designed to resist fading and tarnishing. This fixture is manufactured by Kingston Brass and is part of their Vintage collection.